Some species of fungi can cause serious human diseases, particularly to immuno-compromised individuals. Opportunistic fungal infections are a leading cause of mortality, and present an emerging challenge that requires development of new and effective therapeutics. Aminoacyl-tRNA synthetases (aaRSs) are indispensable components of cellular protein translation machinery and can be targeted for discovery of novel anti-fungal agents. Validation of aaRSs as potential drug targets in pathogenic microbes prompted us to investigate the genomic distribution of aaRSs within three fungi that infect humans – A. niger, C. albicans and C. neoformans. Hidden Markov Models were built for aaRSs and related proteins to search for homologues in these fungal genomes. Here, we provide a detailed and comprehensive annotation for 3 fungal genome aaRSs and their associated proteins. We delineate predicted localizations, subdomain architectures and prevalence of unusual motifs within these aaRSs. Several fungal aaRSs have unique domain appendages of unknown function e.g. A. niger AsxRS and C. neoformans TyrRS have additional domains that are absent from human homologs. Detailed comparisons of fungal aaRSs with human homologs suggest key differences that could be exploited for specific drug targeting. Our cataloging and structural analyses provide a comprehensive foundation for experimentally dissecting fungal aaRSs that may enable development of new anti-fungal agents. The online version of this article (doi: 10.1186/1471-2164-15-1069) contains supplementary material, which is available to authorized users. Fungal infections are emerging as a leading cause of human mortality in hospital settings [1, 2, 3, 4, 5]. Recent trends suggest that select species of fungi have the ability to take advantage of debilitated immune system to cause mortality [1, 2, 3, 4, 5]. Data suggest that diseases caused by opportunistic fungi result in scores of human deaths worldwide, and hence containment of human fungal infections is a pressing challenge [1, 2, 3, 4, 5]. The pathogenesis of such opportunistic fungi is a complex phenomenon since these organisms more often than not lack dedicated ‘virulence’ factors [1, 2, 3, 4, 5]. Therefore, understanding cellular and molecular attributes of these fungal pathogens is indispensible towards developing effective therapeutics. Aspergillus, Candida, and Crytococcus are the three most common genus of fungi associated with infectious diseases in humans [1, 2, 3, 4, 5]. Candidiasis or thrush is the most prevalent fungal infection in humans, commonly caused by C. albicans. Candida is generally present on the skin and mucous membrane and does not cause infection, however invasive candidiasis occurs when Candida enters the bloodstream and spreads throughout the body . Immuno-compromised (as in case of cancer and AIDS patients) individuals are particularly prone to C. albicans infections . Aspergillus species causes second most common fungal infections in humans . A. fumigates is the most virulent species in this genus, and cases of pulmonary aspergillosis have been reported resulting from A. niger infections as well . Cryptococcosis is a fungal disease caused primarily by the two species Cryptococcus neoformans and Cryptococcus gattii. C. neoformans is present in soil and spreads through microscopic airborne fungal spores . C. neoformans infection increases the probability of re-hospitalization of AIDS patients who otherwise show positive response to anti-retroviral therapy [7, 12]. A. niger and C. albicans belong to Ascomycota phylum while C. neoformans belongs to Basidomycota phylum within the fungal kingdom. Genome sizes for A. niger, C. albicans, and C. neoformans are ~33 Mb (19 chromosomes), ~14 Mb (8 chromosomes), and ~19 Mb (14 chromosomes). Predicted number of ORFs (open reading frames) in A. niger, C. albicans, and C. neoformans are ~14000, ~6200, and ~6500. In addition to genome sequencing, transcriptomics analyses for these three fungi are also available [13, 14, 15]. Aminoacyl-tRNA synthetases (aaRSs) drive protein translational machinery by catalyzing the addition of amino acids to cognate tRNA [16, 17]. Structural studies have confirmed their modular architecture, with separate domains for aminoacylation and tRNA binding [16, 17, 18]. Based on their structural fold and mode of tRNA binding these enzymes have been classified into class I and II aaRSs [16, 17, 18]. In addition to performing translational activities, these proteins also localize within mitochondria and apicoplasts to participate in synthesis of proteins encoded by genomes within organelles [16, 17, 18, 19, 20, 21]. Aside from their translational functions, aaRSs are implicated in various non-canonical functions such as gene transcription, mRNA translation, inflammation, and immune response [16, 17, 18, 19, 20, 21]. Therefore, aaRSs constitute a very important subset of proteins in any genome, and inhibition of their enzymatic activity can be deleterious for the host. Ever since the potential of malaria parasitic aaRSs for exploration as new drug targets has been highlighted [19, 22], intense efforts from many groups have yielded an array of druggable malaria parasite aaRSs [23, 24, 25, 26, 27, 28, 29, 30, 31, 32, 33, 34, 35]. More recently, protein translation components from other eukaryotic pathogens like Leishmania and Toxoplasma have also been explored. Hence, experimental dissection of critical translation components like aaRSs is on high priority as one avenue of novel target discovery in pathogen biology. Dearth of structural characterization of larger number of fungal aaRSs severely restricts scope for targeted development of new anti-aaRS drugs, despite the acceptance of aaRSs as druggable targets. In context of this work, C. albicans SerRS is the only full-length aaRS from these three fungal genomes for which crystal structure has been solved . Here, we have studied aaRSs from A. niger, C. albicans and C. neoformans using profile-based Hidden Markov Models (HMM). In addition, homologs for aaRS-related proteins such as the editing domains (AlaX) and D-tyrosyl-deacylase (DTD), Gln and Asn amidotransferases, and aaRS-associated P43 protein have also been identified. Protein sequences of thus identified aaRSs have been comprehensively annotated in context of their domain organization. We discovered novel domain appendages in several fungal aaRSs that are absent from human homologs. Our results highlight key structural attributes of fungal aaRSs that could be exploited for drug targeting to combat mycoses in humans. Computationally translated open reading frames (ORFs) for A. niger and C. albicans were downloaded from their corresponding genome databases available at http://www.aspergillusgenome.org/ and http://www.candidagenome.org/ respectively. Similarly, ORF sequences for C. neoformans were retrieved from FungiDB . To annotate aaRSs and aaRS-associated proteins, a dataset of annotated aaRSs and associated proteins was prepared from the UniProt database . Our dataset included protein sequences of human aaRSs, human aaRS trans-editing domain (DTD, AlaX), Gln and Asn amidotransferases, aaRS associated protein P43 and Ybak protein from E. coli. The UniProt accession numbers for sequences in the dataset are given in supplementary Additional file 1: Table S1. All protein sequences from our dataset were individually used to perform BLAST searches against non-redundant databases available at NCBI. Top 1000 homologs from each BLAST search were saved for further analyses as we reasoned that these may effectively capture the evolutionary diversity at different positions within aaRSs, thus facilitating generation of robust HMMs. For each aaRS, HMMs were generated using the homologs identified from BLAST search. Sequence Alignment and Modeling Software System (SAM)  was used to generate MSA, and HMMER package was used for building profile HMM for each MSA. Significantly similar matches for each HMM profile were identified within the genomic sequences from the three fungi. Pfam  domains were assigned to predicted aaRS sequences from fungal genomes. Sub-cellular localization for sequences showing significant HMM search score was annotated using Wolf PSORTb webserver using default parameters optimized for fungal proteins . For a query protein sequence, this server gives a relative score to each sub-cellular location and the highest scoring compartment has been used here to annotate aaRSs. MitoProt  and TagetP  servers were used to identify signal sequences within the predicted mitochondrial aaRSs. Sequence alignment of aaRSs was performed using T-coffee program with default parameters . Structural conservation was mapped onto the sequence alignment using Expresso options available at http://tcoffee.crg.cat/. Homology modeling for protein sequences was performed using Phyre2 server  and PyMol  was used for structure visualization and analyses. We have employed a profile HMM-based search to computationally identify aaRSs in the three fungal genomes. Our results show that there are a total of 29 aaRSs in A. niger, 28 in C. albicans and 26 in C. neoformans (Tables 1, 2 and 3). This exercise enabled us to annotate aaRSs specific for all 20 amino acids in these fungi (Tables 1, 2 and 3). All predicted aaRSs had highly significant e-values based on profile HMM searches. Functional annotation of these aaRSs was cross-validated using BLAST searches against conserved domain database (CDD) at NCBI. Amongst the three fungi, maximum variation in the full length of aaRSs was observed in A. niger genome with the largest and smallest proteins being IleRS (212883-mRNA) with 1524 residues and TrpRS (209919-mRNA) with 391 residues respectively (Table 1). Interestingly, for some aaRSs there exist multiple enzymes for charging tRNAs that are specific to a particular amino acid (Figure 1). Our results show that there are 8 A. niger aaRSs that are present in two versions (AspRS, GluRS, GlyRS, IleRS, LeuRS, PheRS, TrpRS and AsxRS), 7 C. albicans aaRSs that are present in two versions (GluRS, IleRS, LeuRS, PheRS, TrpRS, TyrRS and AsxRS), and 5 C. neoformans aaRSs that are present in two versions (AsnRS, GluRS, IleRS, PheRS and TyrRS, Figure 1A). These two versions of aaRSs would presumably facilitate localization in different sub-cellular compartments e.g. in cytoplasm and mitochondria. Comparisons amongst the three fungi show GluRS, IleRS, LeuRS and PheRS to be the common set of two-copy enzymes. To analyze compartmentalization of aaRSs, sub-cellular localization was calculated for all predicted aaRSs. Expectedly, this showed that whenever two same amino acid aaRSs were present, one was predicted to be cytoplasmic while the other mitochondrial (Tables 1, 2 and 3). We then were able to compile predicted sub-cellular distribution for all aaRSs (Figure 1B), along with putative signal sequences for mitochondrial aaRSs (Additional file 1: Figure S1). Out of total 29 A. niger aaRSs – 16, 11, and 2 aaRS(s) were predicted to (co-) localize in cytoplasm, mitochondria and nucleus (Figure 1B and Table 1). In C. albicans 13, 9 and 6 aaRSs were predicted to be cytoplasmic, mitochondrial and nuclear (Figure 1B and Table 2). Finally, C. neoformans aaRSs were predicted to be equally partitioned between cytoplasm and mitochondria with 13 aaRSs in each (Figure 1B and Table 3). This analysis presents a conundrum where none of the translational compartments in the three fungi seem independent for generating all 20 charged tRNAs. It is likely that some of the identified aaRSs have dual sub-cellular localizations within the cell. In addition, transport of charged tRNAs between cellular compartments could compensate for absence of any particular aaRS in a given chamber like cytoplasm or mitochondria, as in the case of other organisms . NA in e-value indicates fungal sequences that could be identified by HMM search and were retrieved from NCBI using keyword search. Hidden Markov Model (HMM) based prediction of aaRSs in fungal genomes. (A) Number of predicted aminoacyl-tRNA synthetases (aaRSs) in the three fungal genomes. (B) Predicted distribution of aaRSs in the sub-cellular compartments of the three fungal pathogens. The aaRSs are denoted by the single letter code for their corresponding amino acid and Asx refers to non-discriminating aspartyl-tRNA synthetase. We also sought to catalog trans-editing domains within these fungal genomes. D-Tyrosyl-tRNATyr deacylase (DTD) catalyzes hydrolysis of bond between D-amino-acid and tRNA. These enzymes play an important role in evading toxicity resulting from accumulations of D-amino acids within the cell . Trans-editing domains such as AlaX maintain fidelity of tRNA charging by hydrolyzing incorrectly charged amino acid attached to tRNAAla. Hence, in addition to profile HMM search for 20 canonical aaRSs; screening for aaRS-associated proteins was also performed (see Methods section for details). Our results suggest that trans-editing domains such as DTD and AlaX are found in all the three fungi (Tables 1, 2 and 3). Similarly, the possibility of alternate route for Gln-tRNAGln and Asn-tRNAAsn synthesis was examined [33, 51]. In this alternate mechanism, a non-discriminating aaRS catalyze the synthesis of Glu-tRNAGln or Asp-tRNAAsn followed by catalysis by a corresponding amidotransferase to generate Gln-tRNAGln or Asn-tRNAAsn respectively. Curiously, two separate proteins corresponding to amidotransferase (Asn synthase) were observed in all the three fungal genomes (Tables 1, 2 and 3). The existence of Asn synthase corroborates with the presence of above identified non-discriminating domains (AsxRS) within the host fungi (Tables 1, 2 and 3). Similar to Asn synthase, Gln synthase is a transamidase that catalyzes the synthesis of Gln-tRNAGln from Glu-tRNAGln. In mammals, heterotrimeric Gln synthase (GatABC) is frequently observed within mitochondria for synthesis of Gln-tRNAGln. In addition to aminoacylation activity, subunit proteins of Gln synthase have been shown to be important for proper functioning of mitochondrial activities unrelated to protein translation . We additionally identified homologs for subunit A and B of Gln synthase in the three fungi (Tables 1, 2 and 3), however, homologs for GatF subunit could be ascertained only in case of A. niger and C. albicans. In some eukaryotes, a few aaRSs associate with each other and with auxillary proteins (called P18, P38, and P43) to form multi-synthetase complex (MSC) [53, 54]. It has been proposed that MSC improves translational efficiency by channeling tRNAs to aaRSs and ribosomes . In addition, MSC may serve as a reservoir of pro-cytokines and other regulatory molecules that can be released per physiological requirements . A central component of MSC is P43, a polypeptide of ~43 kDa that harbors tRNA binding domain. P43 is associated with multitude of cellular functions such as protein synthesis, axonal development, glucagon secretion, and autoimmune suppression . Our profile HMM-based screening revealed existence of P43 variants in all the three fungal genomes (Tables 1, 2 and 3). Presence of MSC and its constituents now remain to be addressed experimentally. Profile HMM searches identified a total of 29 aaRS in A. niger – 14 belonging to class I and 15 to class II. Among class I aaRSs – IleRS, LeuRS, GlnRS, ArgRS, and MetRS had N-terminal catalytic domain followed by anticodon binding domain (ABD) towards the C-terminal (Figure 2). Two different proteins corresponding to IleRS were predicted to localize in cytoplasm (52642-mRNA) and extracellular space (212883-mRNA) respectively. However, the synthetase domain of IleRS (212883-mRNA) shares ~36% sequence identity with human mitochondrial IleRS and therefore its sub-cellular localization is likely to be mitochondrial rather than extracellular. Interestingly, one IleRS (212883-mRNA) contains an addition uncharacterized protein family (UPF0183) domain at its N-terminal (Figure 2). BLAST searches for this IleRS (212883-mRNA) against human genome failed to identify a homolog for the UPF part of the sequence (Figure 3A). Two separate proteins for LeuRS were identified, putatively localized to cytoplasm (52554-mRNA) and mitochondria (183116-mRNA). Mitochondrial (121468-mRNA) and potentially nuclear (565891-mRNA) copies of GluRS were also identified. In latter, an additional glutathione-S-transferase C-terminal domain (GST_C, an α-helix containing structural domain) is evident at the N-terminus. Human bifunctional GluRS/ProRS also contains GST_C domain at the N-terminus and these proteins shares 45% identity with A. niger GluRS. The GST_C domain fusion is also present in human MetRS and ValRS. Curiously, the GlnRS (45754-mRNA) lacks N-terminal RNA binding region that is present in human and other fungal homologs (Figure 2). The TrpRSs are two-copy enzymes in A. niger, one each for cytoplasm (54362-mRNA) and mitochondria (209919-mRNA). In case of CysRS, GluRS, MetRS, TrpRS and TyrRS the Pfam server could only annotate their catalytic domains within these sequences. However, based on the catalytic domain positioning it appears likely that their anti-codon binding domains lie towards the C-termini (Figure 2). Domain annotations for predicted aminoacyl-tRNA synthetases (aaRSs) in A. niger . Catalytic domains are labeled with three letter code for corresponding aaRS and number at the end of sequence denotes the length of the protein. ABD - Anti-codon binding, FDX - Ferridoxin-fold ABD, UPF - Unknown protein family, GST - Glutathione-S-transferase, NT - N-terminal, CT - C-terminal, DUF2156 - Domain of unknown function, SAD - Second associated domain. Comparison of domain architectures of A. niger and H. sapiens aaRSs. Homologous proteins from C. albicans and C. neoformans are also shown. (A) An uncharacterized protein family (UPF) domain at the N-terminal of A. niger IleRS (212883-mRNA) is absent in the homolog from H. sapiens. A. niger and H. sapiens IleRSs share ~36% sequence identity. 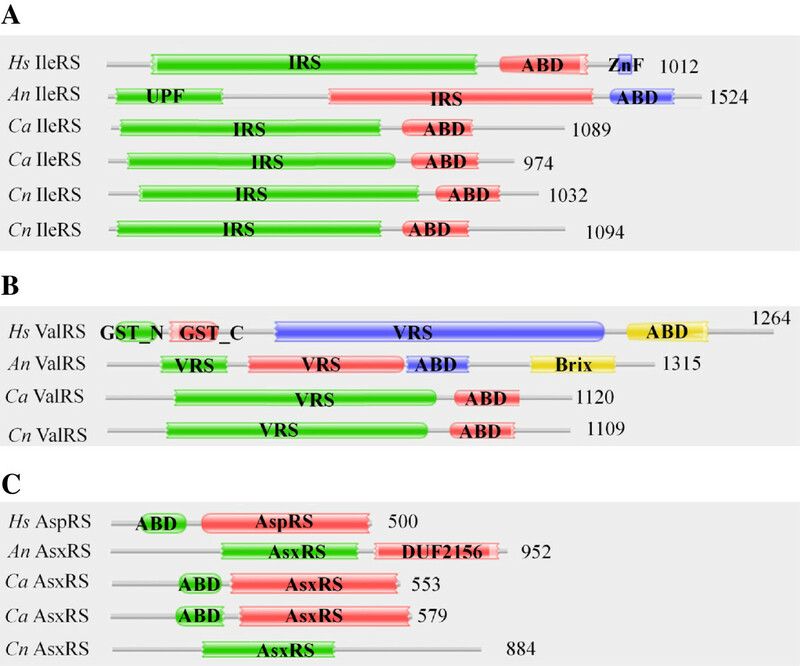 (B) Comparison of domain architectures of ValRS from A. niger (194077-mRNA) and H. sapiens. Brix domain at the C-terminal is unique to A. niger ValRS, and these two ValRSs are ~46% identical. (C) A. niger AsxRS has a unique domain of unknown function (DUF) C-terminal to the catalytic domain. A. niger AsxRS and H. sapiens AspRS are ~45% identical. Surprisingly, A. niger ValRS (194077-mRNA) displays an additional Brix domain at its C-terminus (Figure 2). Protein families containing Brix domain participate in ribosomal biogenesis and rRNA binding . These observations raise an intriguing possibility for cytoplasmic ValRS (194077-mRNA) to participate in rRNA production. The Brix domain in ValRS (194077-mRNA) appears to be unique to A. niger and is not observed in Human ValRSs (Figure 3B). In order to manually annotate the gene for A. niger VRS (having Brix domain fusion), BLAST searches for 194077-mRNA were performed against the A. niger transcriptome database located at the Broad Institute, USA. A highly significant hit was obtained spanning the fungal full-length protein sequence (Additional file 1: Figure S2A). These results indicate that chromosome 16 within A. niger genome codes for VRS-Brix domain fusion protein. Structural modeling for the Brix domain from 194077-mRNA confirms conservation in the catalytic fold with respect to its homologs (Additional file 1: Figure S2B). The class II set of aaRSs in A. niger showed heterogeneity in the relative organization of catalytic and anti-codon binding (ABD) domains. AlaRS, PheRS, GlyRS, HisRS, ProRS and ThrRS had catalytic domains at the N-termini of anti-codon binding domain (Figure 2). While in case of LysRS, SerRS and AsxRS the catalytic domain is present at the C-terminal of the anti-codon binding domain (Figure 2). AspRSs (56196-mRNA and 57039-mRNA) were the only class II proteins in A. niger for which anti-codon binding domain could not be annotated. However, based on Pfam assignment of catalytic domain in these proteins it appears likely that the ABD lies at the N-terminal region (Figure 2). In case of PheRS, two proteins were found with different predicted sub-cellular localization. Cytoplasmic PheRS was predicted to be a heterodimer comprising of α (56159-mRNA) and β (211951-mRNA) subunits. On the other hand, mitochondrial PheRS (55517-mRNA) retain a ferrodoxin fold containing anti-codon binding domain (Figure 2). These observations suggest that the quaternary (tetrameric) structure of mitochondrial PherRS (55517-mRNA) comprises only of one protomer while cytoplasmic PheRS has αβ heterodimer as the basic subunit of the tetramer. Interestingly, we identified two non-discriminating aspartyl-tRNA synthetases (AsxRS) that were predicted to localize in cytoplasm (207470-mRNA) and nucleus (55404-mRNA) respectively. These enzymes catalyze the charging of both tRNAAsp and tRNAAsn with aspartate . Asp-tRNAAsn thus generated is further acted upon by amidotransferase leading to synthesis of Asn-tRNAAsn. Curiously, one AsxRS (55404-mRNA), predicted to have nuclear location, has an additional domain of unknown function (DUF) at the C-terminal (Figure 2) which is missing from the human homolog (Figure 3C). Profile HMM searches for the amidotransferases identified two Asn synthase – 57091-mRNA (mitochondrial) and 186429-mRNA (cytoplasmic) (Figure 2). These amidotranferases together with non-discriminating aspartyl-tRNA synthetase (AsxRS) likely participate in the indirect synthesis of Asn-tRNAAsn. Our results show that there is only one AsnRS which is localized in mitochondria. Therefore it appears that the mitochondrial repertoire of Asn-tRNAAsn is maintained by AsnRS as well as by the combined activity of AsxRS and Asn synthase. The cytoplasmic pool of Asn-tRNAAsn is likely maintained only by the collective activity of AsxRS and Asn synthase enzymes. Homologs for Gln synthase subunits A (170115-mRNA), B (172989-mRNA) and F (173432-mRNA) were also identified (Table 1). These three subunits together constitute an active GatFAB enzyme within the mitochondria and facilitate the synthesis of Gln-tRNAGln within the organelle. Curiously, GatF (173432-mRNA) has an additional domain (DUF726) at its C-terminal (Figure 2). It is possible that the mitochondrial GluRS, like its human homolog, is essentially a non-discriminating enzyme that synthesizes Glu-tRNAGln which acts as a substrate for heterodimeric Gln synthase to yield Gln-tRNAGln. Significant matches for standalone trans-editing and deacylase domains were also observed for two proteins – 189390-mRNA and 56197-mRNA that contains AlaX and DTD domains respectively. We also identified a P43 homolog (210303-mRNA) in A. niger. Interestingly, A. niger P43 has GST C-terminal domain at the N-terminal of the tRNA binding region, which is different from the human counterpart. Indeed, GST_C domain is absent in human P43, however, it is present in P43 homolog from Toxoplasma gondii (Figure 4A). Multiple sequence alignment for P43 homologs shows high conservation in the tRNA binding domains between human, the three fungi, and T. gondii P43s (Figure 4B). However, A. niger P43 sequence has two insertions (one of 4 residues and another of 9 residues) within the structurally conserved tRNA binding domain. Further, the N-termini of these proteins show poor homology amongst each other. Finally, GluRS (56891-mRNA), HisRS (51854-mRNA), and LeuRS (52554-mRNA) were observed to have ‘ELR’ motifs in their N-terminal regions (Additional file 1: Table S2). In human and other TyrRSs this motif can impart cytokine-related activities [21, 60, 61, 62] which are untested in the three fungi so far. Mapping of ELR motifs onto the modeled structures showed that the ELR motif appeared in surface exposed loop regions in these three aaRSs (data not shown). Comparison of P43 homologs from different genomes. (A) Pfam-based domain organization for P43 homologs from Homo sapiens (Hs), A. niger (An), C. albicans (Ca), C. neoformans (Cn), and Toxoplasma gondii (Tg). (B) Sequence alignment for P43s with color codes showing sequence conservation – low (blue) to high (red). Overall, there is high conservation in the tRNA-binding domain at the C-terminal and poor homology at the N-terminals. The total number of aaRSs identified in C. albicans was 28 with 15 and 13 members in class I and class II respectively. The general organization of domains amongst class I aaRSs was prototypical: catalytic domain followed by anticodon binding domain (Figure 5). For ~50% of class I aaRSs, two different proteins were identified specific for a particular amino acid – presumably one aaRS each for cytoplasm and mitochondria (Figure 5). Class I aaRSs for which only one copy was identified includes CysRS (orf19.4931), MetRS (orf19.3955), GlnRS (orf19.7064), ArgRS (orf19.3341), and ValRS (orf19.1295). The cytoplasmic copy of GluRS (orf19.7057) had an additional glutathione-S-transferase (GST_C) domain appended at the N-terminus (Figure 5), like the human bifunctional glutamate/proline--tRNA synthetase. In case of MetRS (orf19.3955), an additional N-terminal domain was identified based on Pfam annotation. This domain is again unique to C. albicans MetRS and is absent from the other two fungal MetRSs analyzed here as well as from the human MetRS (Figure 5). Two proteins each for IleRS (orf19.2138 and orf19.2382) and LeuRS (orf19.2560 and 5705) were predicted to have anti-codon binding domain at the C-terminal of catalytic domain (Figure 5). Two differentially localized proteins each for TrpRS (orf19.4299 and orf19.5226) and TyrRS (orf19.109 and orf19.2694) were also identified (Table 2 and Figure 5). 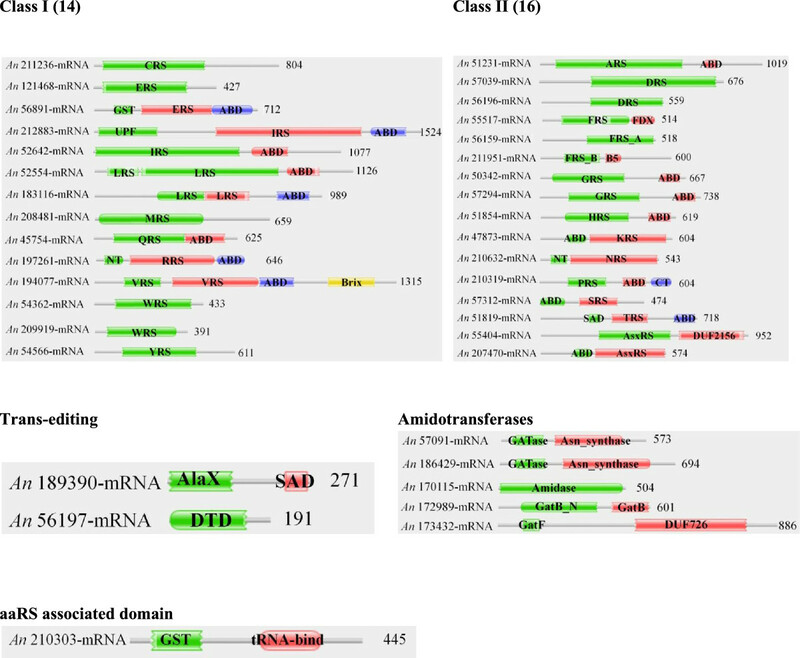 Domain annotations for predicted aminoacyl-tRNA synthetases (aaRSs) in C. albicans . Catalytic domains are labeled with three letter code for corresponding aaRS and number at the end of the sequence denotes the length of the protein. 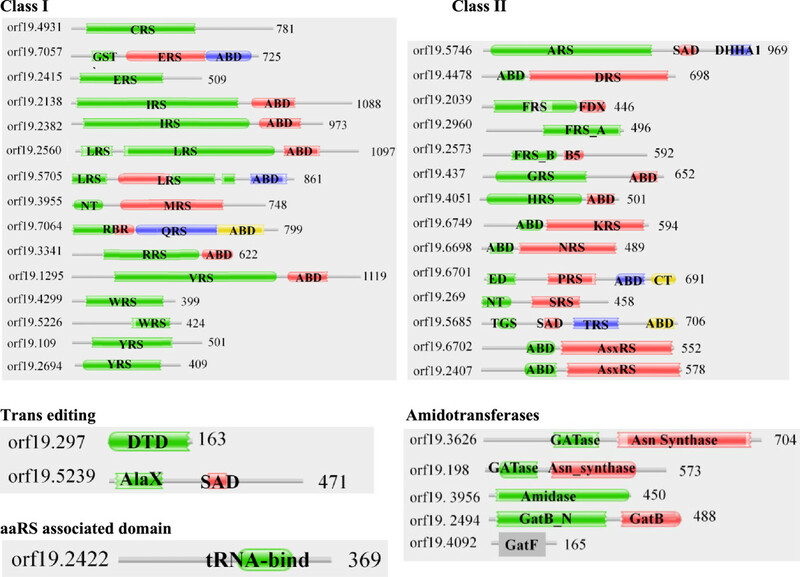 ED - Editing domain, TGS – (ThrRS, GTPase, and SpoT) domain, RBR – non-specific RNA binding region, DHHA1 - DHH associated domain, and other domains are same as in Figure 2. Class II aaRSs were generally present as a single protein except for PheRS and AsxRS. The two PheRSs had different predicted sub-cellular localization with one likely in cytoplasm and other in mitochondria. Like the A. niger mitochondrial PheRS, C. albicans homolog (orf19.2039) also has anti-codon binding domain at the C-terminal of catalytic domain. Further, cytoplasmic PheRS prototypically encompass α (orf19.2960) and β (orf19.2573) subunits (Figure 5). The AlaRS (orf19.5746) has second associated domain (SAD) and DHHA1 domains C-terminal to its catalytic domain (Figure 5). These two domains are characteristic of AlaRSs and contribute to the catalytic activity of the enzyme . ProRS (orf19.6701), in addition to catalytic and anti-codon binding domains, had two additional domains one at its termini: N-terminal (editing domain) and a C-terminal domain. ThrRS (orf19.5685) had TGS (ThrRS, GTPase, and SpoT) and SAD (second additional domain) domains present N-terminal to catalytic domain (Figure 5). Two separate non-discriminating aspartyl-tRNA synthetase (AsxRS) were also identified – orf19.6702 and orf19.2407 (Figure 5). Amongst aaRS-associated proteins, two Asn synthases were identified in C. albicans – orf19.3626 (predicted nuclear) and orf19.198 (predicted cytoplasm). These two enzymes could act in tandem with two AsxRSs to generate Asn-tRNAAsn in an indirect manner. In addition, subunit components of Gln synthase were also identified – GatA (orf19.3956), GatB (orf19.2494) and GatF (orf19.4092) (Table 2 and Figure 5). C. albicans mitochondrial GluRS (orf19.2415) shares ~35% identity with human mitochondrial GluRS (which is non-discriminating), raising the possibility of indirect synthesis of Gln-tRNAGln by the action of Gln synthase on Glu-tRNAGln. Standalone trans-editing domains like AlaX (orf19.5239) and DTD (orf19.297) were also identified (Figure 5). Our results confirm the presence of P43 homolog (orf19.2422) within the C. albicans genome (Figure 5). Three aaRSs – GluRS, HisRS, and LysRS in C. albicans have ‘ELR’ motif at the N-terminal region (Additional file 1: Table S2). The ELR motifs in these three aaRSs were surface exposed in modeled three-dimensional structures (data not shown). Domain annotations for predicted aminoacyl-tRNA synthetases (aaRSs) in C. neoformans . The catalytic domains are labeled with three letter code for corresponding aaRS and number at the end of the sequence denotes the length of the protein. DALR_1 - (Asp, Ala, Leu, and Arg) domain, SAICAR - Phosphoribosylaminoimidazolesuccinocarboxamide domain. Other domains are same as in Figure 2. Vertebrate SAICAR synthetases are significantly different from their microbial homologs both in terms of subunit structure (vertebrate SAICAR synthetase are multimeric proteins) and functions (vertebrates have bifunctional enzymes having AIR carboxylase and SAICAR synthetase activity ). A recent study has suggested microbial SAICAR synthetases as potential drug target . Significantly, we could not identify a homolog for TyrRS-SAICAR fusion protein (CNBA1270) in humans and hence these unusual fused domains seems unique to C. neoformans (Figure 7A). Intriguingly, BLAST searches against non-redundant databases revealed that homologs for TyrRS-SAICAR fusion protein exist only in some other fungi such as Cryptococcus gatti, Trichosporon asahii and Tremella mesenterica. In order to validate this domain fusion in the case of C. neoformans, BLAST searches for CNBA1270 were done against transcriptome database available at BROAD institute, USA. A highly significant transcript was obtained corresponding to the computationally predicted protein sequence (Additional file 1: Figure S3). These results reinforce presence of a chromosomal region in C. neoformans genome that encodes for YRS-SAICAR fusion protein. Modeling of the tertiary structure for SAICAR domain in CNBA1270 confirmed conservation of key residues within the ATP binding pocket (Figure 7B). These observations further substantiate the hypothesis that this fusion domain protein could be potentially targeted for therapeutic development against C. neoformans. Sequence and structural analyses for tyrosyl-tRNA synthetase from C. neoformans. (A) Comparison of domain architectures for C. neoformans TyrRS (CNBA1270) and H. sapiens cytoplasmic TyrRS based on the Pfam domain assignment. SAICAR domain at the C-terminal of C. neoformans TyrRS is absent in the homolog from H. sapiens and these two TyrRSs are ~47% identical in the TyrRS catalytic domain region. (B) Superimposition of modeled C. neoformans SAICAR domain in TyrRS (magenta) and crystal structure of SAICAR synthase (PDB ID 2CNQ) from Saccharomyces cerevisiae (green) with adenosine-di-phosphate (ADP, blue). The two proteins share 51% sequence identity. Inset shows sequence and structural conservation of ADP interacting residue in the two proteins. 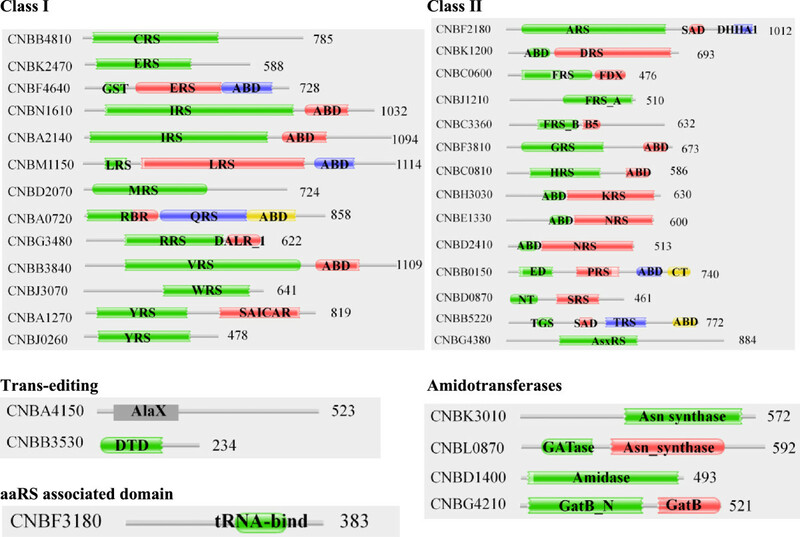 Among aaRS related proteins, four polypeptides were predicted to have amidotransferases activity – two Asn synthases (CNBK3010 and CNBL0870) and other two Gln synthases (subunit A (CNBD1400) and subunit B (CNBG4210)). We were not able to identify any homolog for GatF subunit. Interestingly, all these four amidotranferases were predicted to localize within the mitochondria (Table 3). In addition, a standalone trans-editing AlaX (CNBA4150) and DTD (CNBB3530) were also identified (Figure 6). Interestingly, the mitochondrial TyrRS-SAICAR fusion protein (CNBJ0260) had an ‘ELR’ motif at its N-terminal (Additional file 1: Table S2). This motif in human TyrRS is responsible for cytokine activity. Structural modeling for C. neoformans TyrRS part of the fusion protein suggests that the ‘ELR’ motif is likely to be solvent accessible (Figure 8A). Further, the ‘ELR’ motifs in human and C. neoformans TyrRSs are part of α helices that superimpose well (Figure 8B). Presence of ELR motif at the N-terminal and an additional unique SAICAR domain towards C-terminal makes C. neoformans mitochondrial TyrRS (CNBJ0260) an interesting target for further investigation. In addition, we noted that ProRS (CNBB0150) also has an ‘ELR’ motif towards its N-terminal (Additional file 1: Table S2), which when modeled indicated surface exposure for this motif. Superimposition for crystal structures of human TyrRS (white, PDBID 1N3L) and modeled structure of C. neoformans TyrRS (light green). (A) Residues constituting ELR motif in the two proteins are shown as spheres in red and green for human and C. neoformans, respectively. (B) Superimposition of the ELR motifs from the two proteins. Treatment and prevention of opportunistic fungal infections in humans presents an emerging challenge. Aspergillus, Candida and Cryptococcus are three highly pathogenic fungi, particularly in immuno-compromised patients. Dissecting and understanding critical fungal protein machineries is therefore vital for establishing a base for launching new therapeutics against these pathogens. Within microbial proteomes, aminoacyl-tRNA synthetases have already been exploited for drug discovery . Specifically for fungal aaRS, a novel boron-containing molecule 5-fluoro-1,3-dihydro-1-hydroxy-2,1-benzoxaborole (AN2690) that inhibits yeast cytoplasmic leucyl-tRNA synthetase by trapping enzyme-bound tRNALeu in editing conformation is now an anti-fungal agent in the market . Hence, proof-of-principle exists that can now be expanded to target a much larger number of fungal aaRSs. Our profile HMM-based identification and annotation confirms the existence of all 20 aaRSs in the three studied fungal genomes. In addition, fungal DTDs, AlaXs, P43s and amidotransferases have also been comprehensively annotated. Putative distribution of fungal aaRSs in different sub-cellular compartments within the fungi provides a base for experimental validation. Our results also highlight fungal processes that enable multiple localization of aaRSs and/or of charged tRNAs between cytoplasm and mitochondria in these three fungi since neither their cytoplasm nor mitochondria individually harbor a complete set of 20 aaRSs. Overall, the three fungal genomes harbor similar number of aaRSs. 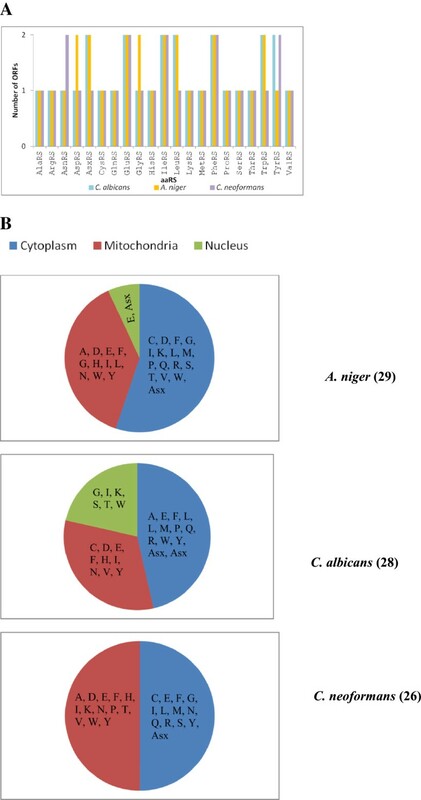 In A. niger, C. albicans, and C. neoformans there exist 8, 7, and 5 aaRSs that are encoded by two different set of genes, presumably for mitochondrial localization (Figure 1A). PheRS, GluRS, and IleRS are the three aaRSs that are two-gene sets in all the three fungal genomes. The distribution for aaRS associated proteins is conserved among the three studies fungi. Our results predict that C. neoformans Gln synthase (Gat) maybe heterodimeric unlike its homologs in other two fungi where it is likely to be heterotrimeric. None of the aaRS in C. neoformans were predicted to localize within nucleus while 2 and 6 aaRSs in A. niger and C. albicans were predicted to have nuclear localization (Figure 1B). The aaRSs identified in these fungal genomes share some similarities with their human homologs (Tables 1, 2 and 3) but also many critical differences (Figures 3 and 6). A. niger IleRS and AsxRS have unique domain fusions which are absent in homologs from the other two fungi and from humans (Figure 3). 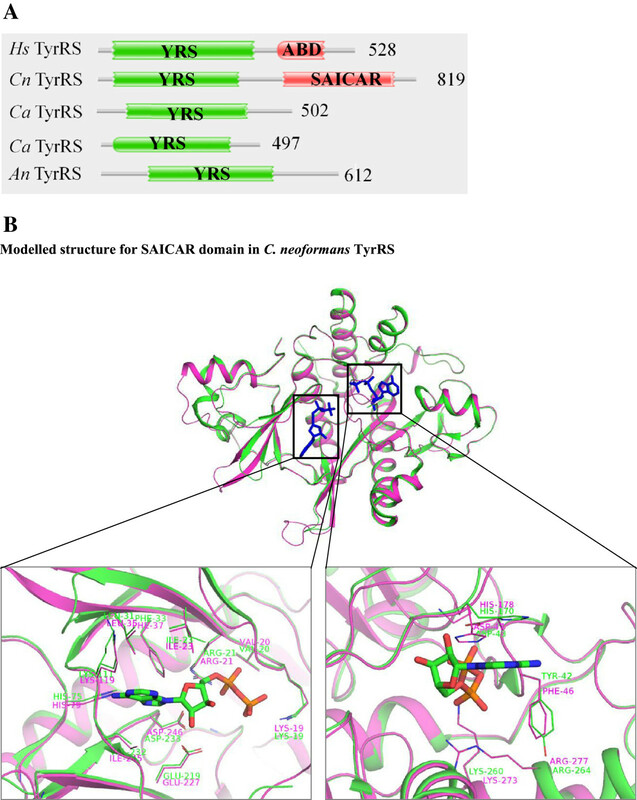 ValRS and TyrRS from A. niger and C. neoformans also harbor novel functionally-characterized domain fusions which are absent from humans (Figures 3 and 7). Further structural and functional characterization of the unique and novel fungal aaRSs is required before they can be exploited for development of anti-fungal compounds. In addition, experimental analyses of fungal aaRSs that display unusual domain fusions may uncover their non-canonical functions. We found N-terminal GST_C domains in A. niger P43 which is distinct feature for this protein in comparison to other two fungi and humans (Figure 4). Our results also reveal presence of novel and unique fusion proteins where domains such as DUF2156 and SAICAR are appended to the aaRS structural cores (Figures 2 and 6). 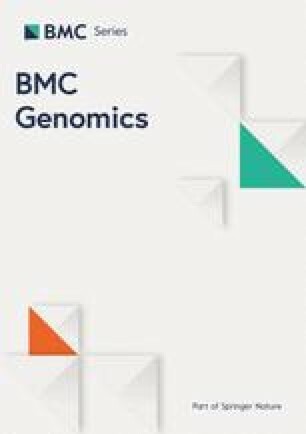 In summary, the comprehensive genomic cataloging of aaRSs from pathogenic fungi detailed here warrants further experimental validation and exploration. The results presented here provide insights into protein translation enzymes within these pathogenic fungi that can be targeted for developing new drugs against these microbes. The data sets supporting the results of this article are included within the article and Additional file 1. OSRP Department of Biotechnology, India grant to AS supported this work. AS is a JC Bose fellow. AS conceived the study. MD did the experiments, AS and MD analyzed the data. MD wrote the manuscript and AS revised it. Both authors read and approved the final manuscript.